Your flammable liquid storage building should be designed for total safety and compliance. That is why U. S. Chemical Storage has achieved the highest quality flammable liquid storage buildings in the industry, designed to bring you the highest protection from a flammable liquid storage building. Just as laws and regulations evolve and change, we’ve evolved over the years to bring you a product that outshines all others. Not every flammable liquid storage building is the same. Flammable liquids each require different environments depending on their characteristics and classifications. For instance, a Class IA flammable liquid requires a different environment from Class II liquids, as they have different flash points. Additionally, flammable liquids must be stored separately from oxidizers and other materials to mitigate the fire hazard and minimize damages. Doing so also ensures compliance, as with any safe storage practice. Practice good housekeeping and allow an aisle at least 3 feet across to allow safe passage and prevent personnel from accidentally tipping a flammable liquid container. With safety training, practice, and research, you and your personnel can safely store and handle your flammable liquids. 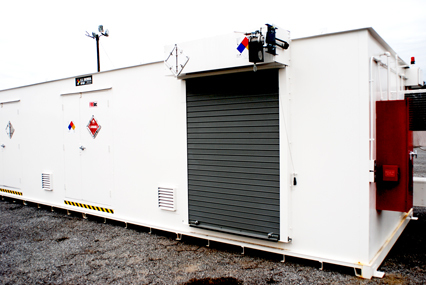 When you’re shopping for a flammable liquid storage building, you require a custom-built structure that is designed to safely store your flammable liquids, safeguarding your facility, community, and environment from potential fires. Compliant flammable liquid storage is designed to prevent dangerous incidents from occurring. This is achieved by understanding and taking into account the characteristics and hazards of the flammable liquids you intend to store. A compliant flammable liquid storage building is furnished with the means to mitigate hazards, with such features as secondary containment, climate control, and fire suppression systems. A flammable liquid storage building should be designed to prevent outside fires from interacting with the flammable liquids within. Additionally, approved electrical systems can lessen the hazards associated with flammable liquid storage. With a flammable liquid storage building from U.S. Chemical Storage, you are assured the safest storage solution, hand-welded of quality materials and pre-approved by FM Global and Warnock Hersey. Our aim is to help you through the buying process while constructing a quality flammable liquid storage building.